BEIJING, Aug. 31,Chinese President Xi Jinping on Friday met with Nigerien President Mahamadou Issoufou ahead of the 2018 Beijing Summit of the Forum on China-Africa Cooperation. China and Niger are good friends with mutual respect and trust, and good partners of mutually beneficial and win-win cooperation, Xi said. The two sides should enhance friendly exchanges, increase communication about governance and development experience, and continue to firmly support each other on issues of core interests and major concerns, Xi said. 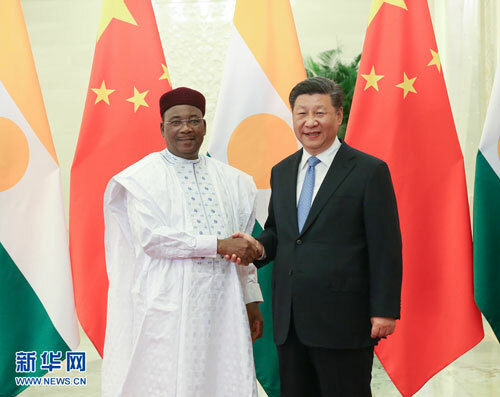 China is willing to expand cooperation with Niger in the fields of medical services, infrastructure building, energy, and transport, and support the efforts of West African countries to boost connectivity, Xi said. China firmly supports Niger's efforts to defend national security and stability, and will continue to provide support for the development of the G5 Sahel joint force through bilateral and multilateral channels, Xi said. While hailing China's great contributions to the progress of human civilization, Issoufou said China has achieved remarkable economic and social development in the past four decades. Niger admires and congratulates China, led by President Xi, for its brilliant achievements in all areas, Issoufou said. With long-standing friendly relations with China, Niger is ready to engage in pragmatic cooperation in the fields of economy and trade, energy and security, and enhance communication and coordination on major international and African regional affairs, Issoufou said.